Box-sealing tape, parcel tape or packing tape is a pressure-sensitive tape used for closing or sealing corrugated fiberboard boxes. It consists of a pressure-sensitive adhesive coated onto a backing material which is usually a polypropylene or polyester film which is oriented to have strength in both the long (machine) direction and the cross direction. 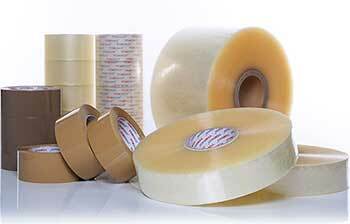 Most often, the tape is 48 mm (approx 2 inches) wide but it is also used in 72 mm (approx 3-inch) widths. A variety of backing strengths and calipers as well as adhesive formulations are available. It is often transparent or tan (beige, buff, brown). Other colors are available. Deliver A Message of Quality with your own Branded Packing Tape – Custom Printed Carton Sealing Tape – Draw attention to your package and alert handlers of special care needs. 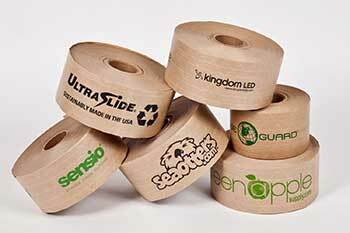 Personalize your packaging system with printed tapes that include your company name and information. 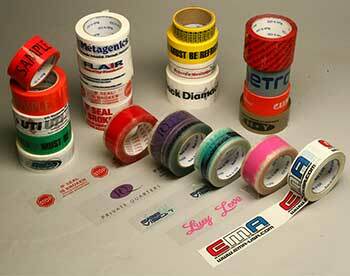 Use printed tape and carton tape to send a message to your customers for just pennies a package. Process Printed Tape is now available for all of your high-end advertising needs. Strong, convenient and dependable, our tubes are manufactured to specification in a wide range of diameters, lengths and thicknesses. The ends can be sealed with attractive closures of metal, plastic, paper or wood. 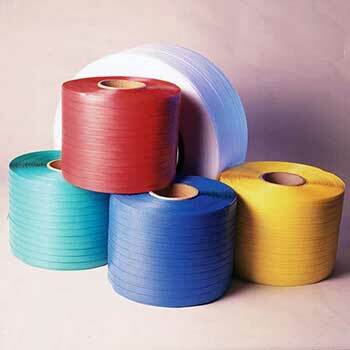 Various colored paper or labels can be applied for an infinite variety of combinations. The inside or outside wraps may be printed for advertisement or identification. 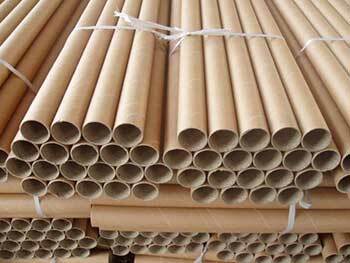 Paper Tubes are ideal for Textile and Fabric shipping, Mailing, Storage, Shipping, Advertising or Display purposes. 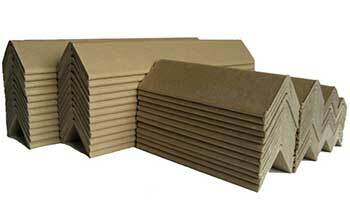 We produce custom paper cores for a variety of industries nationwide. Our specialty is short to medium run custom paper cores for converting, spool and reel manufacturers, ribbon, tape and label manufacturers. Our customers rely on our quality, consistency and fast turnaround. All our custom cores are manufactured to the customer’s specifications at the tightest tolerances. We stock an extensive selection of cores 3.025″ID x .125″ wall in lengths ranging from .50″ to 10″. Please call for a complete list of available sizes. Prevent Complaints, Claims And Lost Orders Our Edge Protector is a low cost, highly effective way to protect your product during storage or transit. By preventing damages to vulnerable edges and corners, BPC’s Edge Protector stops customer complaints, cuts down rejections, reduces claims and prevents lost orders. Oriented or tensilized polyester and nylon are the strongest plastic strapping products and are used as a viable alternative to steel strapping in some industries. Polyester provides excellent retained tension on rigid loads. Its excellent recovery properties help a load absorb impact without strap breakage. Polypropylene strap (oriented or tensilized) is an economical material designed for light to medium duty unitizing, palletizing and bundling. 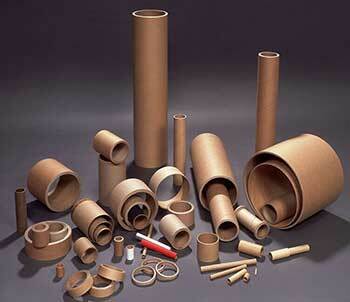 It is available in various widths, thicknesses, and polymer variations (e.g., copolymers). Most polypropylene is embossed, some of which is also printed. This product offers higher elongation at break but tends to have irrecoverable dead stretch with constant stress. What is not generally known to end users is that polypropylene strapping will lose about 50% of the applied tension within one hour, and that this tension loss is accelerated with increases in ambient temperature, consequently although suitable for packs with a degree of stored energy that will take up any relaxation that occurs in the strap, unacceptable strap slackness may occur after time if used on product that is ‘Solid’ such as bricks or concrete. Furthermore polypropylene strapping is susceptible to UV degradation and can quickly degrade if left outside exposed to the elements. The sensible choice of color will retard the process, such as specifying black strap. Similarly, a UV inhibitor can be specified. Polypropylene strapping may be printed, either during production and pre-embossing for the highest quality and precision, or post production over the embossing for a reduced quality. Both offer security and marketing advantages to the strapped product. 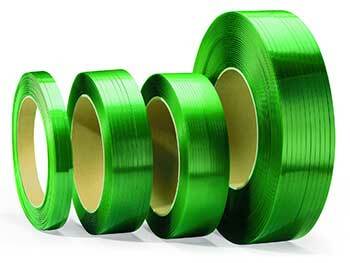 Steel is the oldest and highest tensile strength strapping. It is available in a variety of widths and thicknesses as well as variations in the grade of steel. Steel is used for heavy duty holding where high strength and minimal stretch are desired. Surface finishes for steel strap include: paint, paint and wax, bluing or zinc and wax. The wax is used to better transmit the tension around the bundle and for use with certain types of tensioners. Common applications include steel coils, bundles of metal, baling wire, bricks and pavers, and roll end-binding.